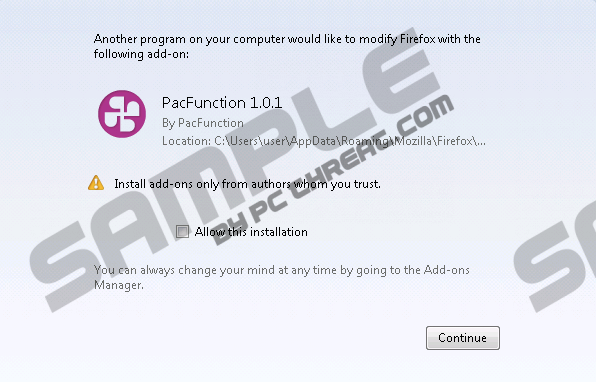 PacFunction is a browser add-on which you can find on your web browsers after installing bundled software. Our malware researchers have found out that the extension could be installed silently after acquiring the infamous TornTV from torntv-tvv.org. This version of the application is published by Install Lab ltd., and we do not recommend trusting it. In fact, you should not trust any application which can download unfamiliar software onto your PC without your consent. If you continue reading the report prepared by virtual security researchers, you will learn more about PacFunction removal and the activity of the plugin. There is no doubt that PacFunction was installed onto your PC alongside other software, whether it was done with your knowledge or illegally, because the official download page pacfunction.info is not active. The same has been discovered when researching Crimsolite, Laflurla, Mega Browse, and other widely spread browser applications. Just like these programs, PacFunction can be installed onto Mozilla Firefox, Google Chrome and Internet Explorer browsers, and the removal of the extension is performed via the Control Panel. Unfortunately, not all computer users realize that certain registry keys and files, including Au_.exe, could remain running on your personal computer. As mentioned before, in order to delete PacFunction from the system successfully, you need to remove the plugin and the components related to it. Not many Windows users are experienced enough to perform this task on their own, which is why automatic malware removal software is the best solution in this case. Even if you succeed with the manual PacFunction removal, we still recommend installing automatic malware detection and removal software to guard your PC and delete other threats which may have been installed onto the computer silently as well. Access the Metro UI menu, right-click and select All apps. Open the Start menu. Click the Windows icon displayed on the Task Bar. Right-click the application you want to remove and select Uninstall. Click the Start button on the Task Bar and a menu will pop up. Click the undesirable program and select Remove to get rid of it. Quick & tested solution for PacFunction removal.